Welcome to communication central at Hands & Voices! 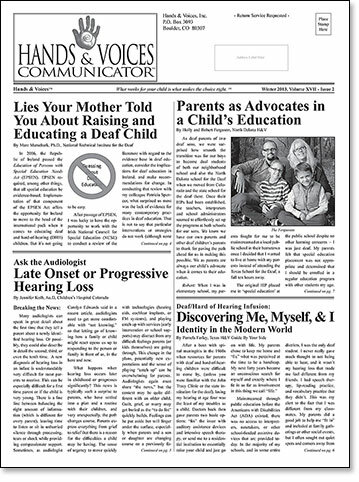 Through our quarterly newspaper, The Communicator, Hands & Voices influences policy, supports parent advocates, and connects families and professionals to both the day to day experience of raising a deaf or hard of hearing child and to our shared experience no matter where we live. We especially look for thought-provoking pieces that illustrate the strengths and needs of our current educational systems, from birth to age 21. You can contribute to the success of The Communicator by becoming a member. Membership ensures the regular delivery of The Communicator into your hands each March, May, September and December. Click for info on joining H&V. Contributions to the newspaper are welcome. Consider sending a query letter first to the Features Editor at editor@handsandvoices.org. Submissions should support our mission and philosophical values of nonbiased family support. Families are of course welcome to tell their own story as well. News of events in your chapter or location are encouraged. The editors reserve the right to edit submissions for clarity, space, and content. Pictures are also welcome. “Tidbits” or short news pieces that families can quickly put to use, such as software releases, captioning news, or other brief news of note. These typically run without bylines. We are always looking for up to the minute information on what’s new in deaf education, research, practices, technology and access. Please use a clear 12 point Times New Roman type in a Word document, and send proposed articles as attachments along with a byline, suggested, short title, and full contact information. Pictures should be in jpg format and high resolution (300ppi) with captions. The deadlines for submissions are January 15 (spring issue), April 15 (summer issue), August 15 (fall issue), and November 15 (winter issue). Questions? Send a query letter to editor@handsandvoices.org.